For most Canadians, the annual switch from long to short sleeves is a welcome sign of spring. Until recently however, Laurel Liddicoat-Newton dreaded the thought of baring her arms and legs in front of staff and students. 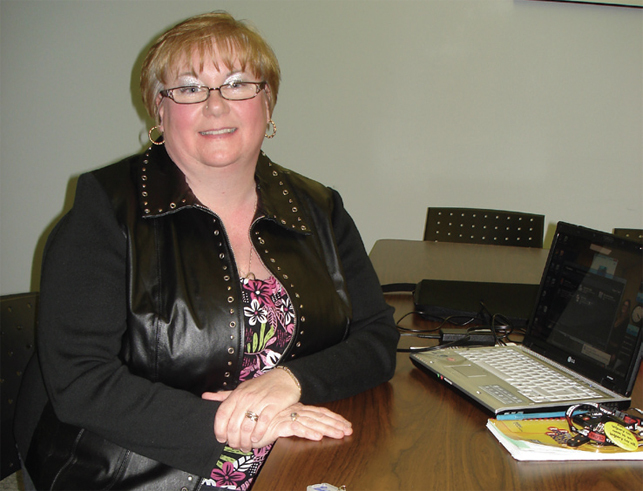 Liddicoat-Newton is the learning resource teacher at Lansdowne Elementary School in Sarnia. In the fall of 2005 she was reassigned to a classroom in the school’s eight-classroom port-a-pac (eight temporary buildings sharing a hallway attached to the doorway of the main building) and began dealing with a virulent case of hives. For the entire year, long sleeves and long pants helped her maintain some measure of dignity between scratching spells, but the combination of spring showers, warmer temperatures, and an airtight classroom aggravated what had become a chronic condition. Liddicoat-Newton was well acquainted with environmental concerns plaguing her school’s main building. But she did not immediately suspect that her workplace was the cause of her hives. Curing her condition would eventually require her to lead 13 colleagues in a work refusal. Workplace Health and Safety Issues have turned Liddicoat-Newton into a health and safety advocate and a leader in her school and in her union. Her involvement dates back to her arrival at the school. “When I moved to a grade 1 assignment at Lansdowne in 2001, my classroom in the main building had an odour. It smelled like tar. I taught in Petrolia for 10 years so I knew the oily kind of smell. Kids came to grade 1 and got nosebleeds. After three years of complaining, I finally got some parents on board,” she says. The tar smell was most pronounced on days when the temperature rose above 20 degrees. Scheduling air quality testing during periods most likely to produce positive results was next to impossible. Liddicoat-Newton and the parents persisted, and eventually air quality testing confirmed suspicions that she and her students were working in an unhealthy environment. Invasive exploration of the roof and ceiling exposed large clumps of hard tar pitch hidden behind concrete. As a result, the class was evacuated for two months while the area was cleaned. In the meantime, Liddicoat-Newton became the health and safety representative at Lansdowne. Little did she know how personal this role would become. The board followed up with room-by-room clean up from October to January. During Christmas break, workers stripped and rebuilt the portables, but not the hall connecting them. January 2006 was very wet and the hall roof leaked in seven locations, but there was no remediation. Meanwhile, Queen Elizabeth II School in Petrolia reported similar conditions. Their portables were eventually sealed by the Ministry of Labour. Liddicoat-Newton turned to her Lambton Kent ETFO Local for help. The vice-president contacted professional relations services and health and safety staff in provincial office. They called the Ministry of Labour and real action began. An MOL inspection revealed mould under a loose edge of wallpaper, and this led to a more thorough investigation. During Easter weekend 2007, the board hired a new company (not the one first hired to do remediation in the portables in 2005) to remediate classrooms, but Liddicoat-Newton remained sceptical. Her worst fears were confirmed by March break when workers ripped away skirting from the base of the portable and exposed an expansive growth of cauliflower-like mould on the bare ground below. There was no cement pad base under the two end units and all the rainwater from the roof was directed to this area. The board called in the same company to remediate. Liddicoat-Newton called her union. When she came back from March break, Liddicoat-Newton refused to re-enter the port-a-pac. Under her leadership, 13 others took the same stand. In support of their action, they presented the board with a letter signed by the whole group. It had been prepared by ETFO’s lawyer and an ETFO staff health and safety officer. Classes moved to a temporary site for three weeks, while remediation work took place at Lansdowne. News of the group’s success spread quickly, and many other schools with sick staff and problems with mould registered grievances. ETFO President David Clegg came to the defence of the teachers with strong statements to the media. ETFO won a favourable arbitration ruling in summer 2007. The settlement ordered investigation of all 55 schools by a new company. Liddicoat-Newton was appointed to accompany investigators as ETFO representative so that staff would feel comfortable answering questions openly. Liddicoat-Newton never returned to the port-a-pac. She taught in the library until October when work was completed on a two-room addition, which replaced the eight portables at the school. Liddicoat-Newton proudly admits that she lost faith in the leadership of her board, but not that of her union. Motivated by the health and safety training she received from ETFO, she now serves as school steward, health and safety site representative, elementary facilities representative on the joint health and safety committee, local executive officer, social committee chair, and budget committee member. This year, Liddicoat-Newton is enrolled in ETFO’s Union School. As part of a required project, she conducted a survey about workplace violence. Overwhelmed by 200 responses, Liddicoat-Newton is convinced people want an opportunity to talk. She sees ETFO’s role changing as education changes. Working in a safe, healthy environment should not be a lottery but a right. She stands firm in her belief that having ETFO support and encouragement is a win-win situation. Valence Young felt inadequate and uniformed in her role as worker representative on her board’s health and safety committee, even though she had participated in a work refusal and had advocated for staff during Ministry of Labour (MoL) investigations of schools in the Renfrew District School Board. “While I was on the joint H & S committee, we had three (MoL) investigations in one year involving asbestos, mould, and indoor air quality,” Young says. Although she did have WSIB-approved H&S certification, Young believed she needed something more. Young enrolled in ETFO’s Reflections on Practice leadership institute in 2007. Joining 29 other women, she attended three face-to-face meetings, conducted an action research project, and reported on her findings. “If your role is to represent your colleagues, you fill the gap with the most accurate research you can find. When you learn that staff concerns are serious, and are concerns in workplaces across sectors, you realize you have a tiger by the tail,” she says. “The MoL investigations all happened while I was doing my research on the effectiveness of the occupational health and safety procedures in our schools. Young’s research showed that teaching staff are often reluctant to become involved in health and safety issues. “When you’ve done accurate research in search of best practice, in terms of basic legislative requirements of the Occupational Health and Safety Act, then you have leverage to speak out with conviction. If you can stick to the facts and reflect the requirements of the legislation as you speak, that increases the potential for progress on difficult issues,” she says. Speaking with confidence is exactly what Young did as she presented multiple resolutions addressing health and safety issues at ETFO’s Annual Meeting. She also agreed to serve on ETFO’s Provincial Health and Safety Committee. Discovering that her voice and work were important encouraged Young to enrol in the Master of Industrial Relations program at Queen’s University. She hopes to base her Master's research paper on her original Reflections on Practice report and is gathering data about the effectiveness of the internal responsibility system for occupational health and safety in the education sector. “The idea of being of service is really important to me. I think I’ll be better able to serve workers in the workplace once I’m done,” Young says – with confidence. Last spring the special education resource team at Newcastle Public School volunteered to participate in a professional learning community project that paired special education resource teachers (SERTs) with classroom teachers. Last year Bobbie Chatha became a coach at her school, supporting colleagues as they looked for ways to improve literacy instruction.